Colin Firth is having a pretty good year. First he won an Oscar for the King’s Speech, and now he also has a paper out in Current Biology! When guest editing Radio 4’s Today programme in December, he suggested that it could be interesting to investigate whether there were any differences in brain structures between people who lean toward the left or right of the political spectrum. Geraint Rees of UCL ran the ensuing study, scanning the brains of 90 people to find associations between brain properties and self-reported political preference. Previous studies had found that certain characteristics matched to either liberal thinkers or more conservative minds. People who identify as politically left-leaning are more likely to prefer change, and that has been shown to correlate with increased neural activity in the anterior cingulate cortex. But Firth asked whether the brains actually looked different, and Rees now showed that indeed the progressive voters also had an increased anterior cingulate cortex compared to more conservative voters. And how do you recognise the brain of a conservative? They have enlarged grey matter in the right amygdala, associated with an increased fear response, which is in line with previous work that showed that right-leaning voters have increased sensitivity to threatening facial expressions. This brings up all kinds of complicated philosophical questions about free will, but the only question I have right now is: what’s Colin Firth’s Erdos-Bacon number? What people won’t do when they’re star-struck. I am actually glad, though: I think it’s great to involve "regular" citizens in science. 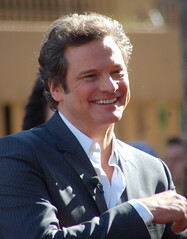 I wouldn’t say Mr. Firth is exactly regular, but I bet he wasn’t used to seeing how things work from the inside. Also, it’s good of Dr. Rees to acknowledge the ideas as well as the execution of the experiments planned to test those ideas. Many lab directors end up authors on publications for less. I hope that Mr. Firth, like any co-author, feels liable for the content of the paper bearing his name, and that he understands its contents to the extent that he feels like he could defend them. I also must express a little astonishment that from a hypothesis mentioned in December on the radio, the laboratory of Dr. Rees was able to conduct the study in question and submit the paper by January 11th. I wish I worked as fast toward tangible, publishable results! I suspect they may have already had the 90 scans (and the results of questionnaires of which political orientation was one of the questions) lying around, and just did the statistical analysis on the correlations for the relevant brain regions. If they had all the data and only got the inspiration for that particular correlation, it doesn’t take long to do. There’s also a second group of scans mentioned in the paper, of 23 people, which could have been done after first submission on editor’s request. Just speculating here. I know that my Erdõs number is 7, and that I do not have a Bacon-number (and am unlikely to ever get one). But a Firth number…. Let’s see whether I can find it out (or does someone have a quick script for that? There might be only a handful of celebrities or film stars who have been in science or interested in science. Usually their inclination towards science is not widely reported in the media, more or less is under the carpet. Not until Natalie Portman won the Oscar people knew of her scientific background. Since the public relate more to the celebrities than scientists, it wouldn’t be bad idea for the stars to promote science as ambassadors and bring it close to the public. Tej, your idea for celebrity spokespeople for science also came up at SciBarCamb earlier this year. http://easternblot.net/2011/04/12/scibarcamb_with_a_bunch_of_boffins/ Firth would be a good one to add to the list. For sure Firth would be a good one to add. Here is a post I found on the hollywood celebrities who are/were into science. And I read your blog on SciBar camp. Looks like you all had lot of fun!!! Great!! @Eva. The same goes for me.